There are several cloud accounting softwares available, but as I mention in the Best Productivity Apps for Small Businesses, I believe that Xero Accounting is the best full-featured accounting software on the market today. It’s relatively inexpensive and will save you a lot of headaches in managing your business’s finances. Why do you need cloud accounting software? Cloud accounting software allows you to access your financial data, send invoices, pay bills, and more from whichever device you happen to be using, whether that’s your office computer, home computer, smartphone, or tablet. Traditional accounting software has to be installed on a single computer and doesn’t allow you to share data between devices. Using cloud accounting software let you easily give access to your employees, your CPA, etc., as you need to. One of the most important functions of your business, Xero makes invoicing your clients simple and straightforward. Clients can pay right on the invoice using a debit or credit card or using Paypal. You can also setup automated invoice payments reminders to help you get paid faster. Have clients that you bill every month for services? 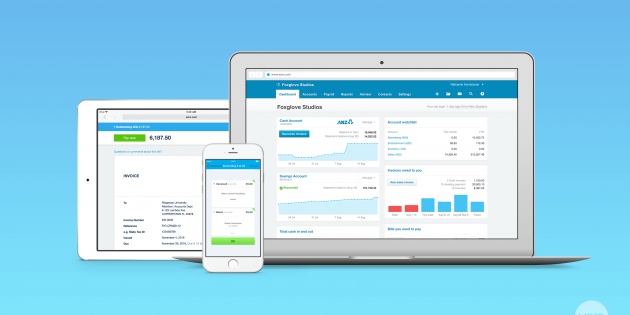 Xero lets you set up recurring invoices to save you some time. Best of all, you can do all of this from your smartphone or tablet while on the go. Xero lets you schedule payments and batch pay suppliers by bundling multiple bills into one payment transaction. All of your bills and associated documents can be stored electronically for paperless record-keeping. In Xero, you can record, claim, and manage all of your expenses. Record all of your purchases and then reimburse yourself or the business as necessary. Reimburse employees, manage their expense reports, and schedule payments all through Xero’s interface. The Xero app makes it easy for you and/or your employees to capture receipts and make expense claims. As your business grows and you start hiring more people, Xero allows you to track employee hours, automatically calculate and pay all applicable payroll taxes, and schedule payments via check or direct deposit. You can also give your employees access to submit their timesheets and view pay stubs. You can always go in and get a real-time view of what bills are coming due and what invoices are outstanding to help you stay on top of managing your business’s cash flow. You can see all of your accounts and credit cards in one dashboard. One thing I love about Xero is that they provide a variety of comprehensive small business guides on topics like accounting, marketing, and business management to help you succeed in your journey. Why is Xero Accounting better than Quickbooks? Xero integrates with just about every other service out there including payment processors like Paypal and Stripe, whereas Quickbooks makes you use their own payment service. Xero’s pricing is friendly for new as well as growing businesses. Plans start at only $9 per month (with limits on the number of invoices, bills, and bank transactions per month). The $30 per month plan gets you unlimited transactions, as well as payroll for up to 5 employees. Then the $70 per month plan gets you payroll for up to 10 employees, as well as multiple currency transactions for companies with international operations. For a relatively small amount of money, Xero Accounting automates a lot of the administrative side of your business and saves you a lot of time that you can spend focusing on how to grow the business. Go ahead and sign up for their 30-day free trial and see for yourself. If you have any questions setting up or using Xero, Contact Us and we can get you all sorted out. I tried using it on mobile app through Android operating system but it din’t work for me. Can you help me out. Thank You. Thanks for sharing this. I want to sign up to 30 – day free trial. I heard a lot of good review about Zero. I want to try it. I am now super excited.